my Ink well: Happy Birthday Jenny! CAS-ual Fridays challenge this week is to use acetate or vellum on your project. My clouds and top of the water is made with a beautiful piece of vellum I took from a card I recently received. This birthday card is made with love for my good friend Jenny who lives in England and whose birthday is today! I hope the real thing got to you today Jenny, but in any case, have a smashing birthday!!!! Super cute card! Love all the details you used in creating the little scene! The vellum clouds and waves are wonderful! Thanks so much for playing along with us this week at CAS-ual Fridays! What a fun scene you have created. Super card. SUPER super cute! LOVE the airplane and the details of the sand and star fish! 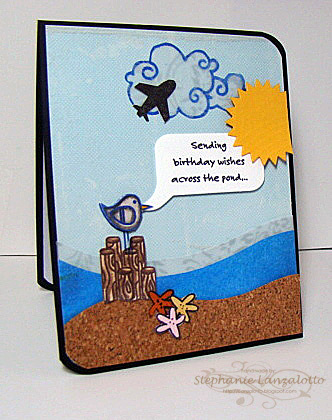 FUN card all around:) I know your friend will love it! Such a perfect card for Jenny! Love the beachy scene and the cork sand! My card for her is still in the post somewhere - probably stuck in the Bermuda triangle!